NOTE: KSP 1.4 (either full release or latest pre-release, or 1.4.X) is required for SpaceY 1.17 or later. Do you want more parts!? If you do, you can also install SpaceY Expanded with even more parts, and 7.5m diameter! Engines with multiple sized fairings, or with conical fairings. Engine clusters with mode-switching for activating/deactivating nozzle groups. Stack size adapters with multiple target diameters (adaptive shrouds). Fuel tanks with automatic shrouds. Thrust plates and adapters with fairings. NBZ, for lots of input, ideas, part names, and art feedback. Akira_R & 4nxs, for their HotRockets configuration work to add variation between vacuum/atmo effects. And many others for bug reports and feedback! SpaceY Lifters is a parts pack that is intended to extend the stock line-up of parts for lifting heavy payloads to orbit, by providing a similar update to the NASA/ARM pack from 0.23.5, in the next size up. It provides a range of 5m fuel tanks and engines, a fueled 3.75m nose-cone, both "stack" and "radial" decouplers, a fueled size adapter, large docking ports, adaptive size adapters, upper-stage thrust plates with shrouds, and a range of powerful SRBs. The name is a play on "SpaceX" in the real world, but also has the amusing double connotations of being "spacey", and also "Space, why?" -- Because it's there! All of the models and textures were made 100% from scratch, using Blender, Photoshop, and Unity. Maintain a "pretty", but still mostly stock-alike appearance. While KW goes a long way toward realism, we want to have a smaller pack that blends nicely with stock, and other stock-alike packs. While extending the stock game, try to maintain a gameplay balance with stock. Stay memory efficient. Similar parts attempt to share the same textures (currently ALL fuel tanks use just one texture). Another layer of large rocketry, beyond the 3.75m ARM/NASA update that was added in KSP 0.23.5. Specifically, 5m parts. Large SRB options with high thrust and shorter burn times than the NASA/ARM SRB. Large rocketry utilities-- Big radial decouplers with thrusters built in, larger sepratron, big docking ports, etc. 5m -> 3.75m stack adapter. 1. If upgrading from a previous copy, it's recommended to delete the old "SpaceY-Lifters" folder first. 2. Backup your "saves" folder! While not required for installing mods, it's a good idea anyway. If any parts you have already used (including stock parts) fail to load, you'll have ships getting deleted! 3. Download and open the ZIP file. 4. Copy the "SpaceY-Lifters" folder into your "GameData" folder. 5. If upgrading, check your designs in the VAB/SPH. If attachment nodes have changed, you may need to reposition parts. Fix: Reinstall the mod correctly, and in its entirety. The MM config files include rules for what to do when color-changing isn't available, so please don't delete those. 4. Firespitter and/or InterstellarFuelSwitch are installed, but not functioning. Fix: The most likely cause is that the version of FS or IFS doesn't work with your version of KSP (for instance, you upgraded to KSP 1.1, and the mod is meant for 1.0.5 or earlier), or your copy is only partially installed. Delete it, and install the latest version of it. 5. ModuleManager thinks color-changing is available via Firespitter or InterstellarFuelSwitch, but neither is installed. Fix: This is a little trickier to pinpoint. Either another mod has bad rules in it (for instance using "FOR[Firespitter]" instead of "NEEDS[Firespitter]") and is therefore tricking ModuleManager, or one of these two mods is only partially installed. That could happen if you removed them via CKAN but the directories still exist, which ModuleManager will see as having them installed. To fix, either make sure both of those mods are completely uninstalled, or install one (or both) of them. Only the DLL from one of them is needed, you don't need the entire mod. But it needs to be running if ModuleManager thinks its there. 6. It's possible that another mod may be confused that changes how VAB/SPH tweakables or engine shrouds work. This is an odd case, but not impossible. When you don't have Firespitter or InterstellarFuelSwitch installed, the alternate paint jobs are disabled by turning them into "engine shrouds" that correspond to an attachment node that is a kilometer outside the VAB. If another mod interferes with this, such as defaulting all shrouds to "on" even when detached, then you might also see z-fighting. Sadly, the solution might be to simply not use the mods together. 1. Files may be missing, or not where the mod is expecting to find them. Fix: Make sure you've installed the mod correctly, in its entirety, and in the right location. Don't rename folders. You can try completely deleting the mod and reinstalling (which is the best way to update the mod anyway). Also make sure the mod's dependencies are installed (SpaceY Expanded requires SpaceY Lifters, for instance). 2. ActiveTextureManagement is goofing it up. Fix: Either remove ATM, or try deleting ATM's cache. ATM frequently has cache issues that cause problems for texture reassignment across folder boundaries. ATM doesn't help as much as it used to, now that stock KSP and most mods use DDS texture format. We've included configs to try to stop ATM from processing this mod's folder, but that may not be working either. Cause: ModuleManager thinks that HotRockets is installed, but it actually isn't. Fix 1: Install HotRockets so that it's a non-issue. Fix 2: Go into the SpaceY folder(s) and delete "SpaceY_HotRockets.cfg". This will keep it from trying to use the HotRockets plumes. Fix 3: Figure out which other mod is causing the confusion, and remove it. We still don't know which mods are causing this, but it's probably due to someone using a "FOR" statement in their MM config instead of "NEEDS". 1.17.1 (2018-04-02) - KSP 1.4 update. - Corrected a copy/paste mistake in color-changing config. 1.17 (2018-04-02) - KSP 1.4 update. - Reworked color-changing to use KSP 1.4's mesh switcher. - Flag decals disabled for now, since the stock mesh switcher doesn't play nicely with them. - Disabled auto-caps on tanks, due to KSP bugs over several versions. - Added some wildcards to TweakScale config. 1.16 (2017-01-30) - SRB Update. - Corrected smoke emitter location on the 3.75m SRB, 21m length. - Added a 30m long 3.75m SRB. - Added a 29m long 2.5m SRB. 1.15.1 (2017-01-03) - Compatibility Update. - Added "NEEDS" conditionals for ConnectedLivingSpace and EngineIgnitor patches, to clean up log spam. - EngineIgnitor patches moved to their own file in the patches folder. - Added "NEEDS" conditionals for Engineering Tech Tree compatibility. - Added new RCS sounds/effects. - Added a linear RCS thruster. - Updated OMS engines to use new RCS sounds and effects. - Added two adapters that can be used with the Rose/Rosette adapter center slots. - Updated custom part category with recent additions from here and SpaceY Expanded. - Added some missing search tags on thrust plates / adapters. 1.14 (2016-10-12) - More KSP 1.2 Compatibility & Fixes. - Landing legs should now work in the Landing Gear action group automatically again. - 5m Fairing base null reference exception corrected, and is available again. - Names adjusted on some thrust plates / adapters. - Version changed to 1.14 to make it more clear this is a significant 1.2 update. 1.13.2 (2016-10-10) - Basic KSP 1.2 Compatibility. - Added KSP 1.2 and KerbNet modules to probe cores. - Landing leg suspension disabled until a 1.2 solution can be found. - Using ModuleAnimateGeneric for the time being, so legs can still be used. - Will need an Action Group, or the Default Action Groups mod, for best results. - Categories adjusted for several parts, corresponding to 1.2 changes. - Icon-only shroud added to fairing base, for easy identification in menu. - 5m conical bay added to custom parts tab. - Added MM "NEEDS" conditionals to RemoteTech modules in probe cores, and moved to separate patch file. - Deadly Reentry patch file renamed to sort properly in the folder. - Added a compatibility exclusion for HPTechTree. - Adapters and Thrust Plates marked as passable for Connected Living Space so that they can be used for station construction, and docking ports, etc. - Added 5m/3.75m conical payload bay. - Adjusted the "hide if empty" rules for the tech nodes. - Massive Rocketry/Structure tech nodes are now set to be hidden if empty. - Fixed a harmless mistake in the MM patches, as part of its self cleanup. - Adjusted some nickname tags on engines. - Minor tech tree and config changes in MM patches. Partly for better compatibility with Real Scale Boosters. - Non-CTT tech nodes are now added, even if CommunityTechTree is installed. - Gigantic Rocketry node internally renamed to match CTT. May have to re-unlock if you don't use CTT. - Added configs for docking ports to use IndicatorLights, if installed. - Reworked docking alignment lights to be slightly prettier when turned off, or dim, etc. - Restricted liquid fuel engines, fairings, and decouplers to non-surface part testing contracts, to match SRBs. - Changed underlying texture for Docking port alignment lights, for compatibility with IndicatorLights. - Converted small lighting textures for docking ports to DDS format. - Refined the primary launch clamp's internal layout, to use as a template for later projects. - Added basic thrust curves for SRBs. Flat profile, however thrust tapers off during last 5% of remaining propellant. - Corrected AVC version number. DOH! - Updated Probe cores and reaction wheels to use IndicatorLights if available. - Probe cores now also have a toggle option for light-up labels that correspond to the indicator lights. - Corrected a missing texture placeholder for the 3.75m stack separator. - More search keywords on engines. - Added colliders setting for procedural fairing base. - Updated heat shield's staging settings to match stock changes in 1.1. - Fixed the "always transparent" problem in the VAB for the service/cargo bays. - Tech Tree nodes are no longer hidden if empty. - Corrected some copy/paste mistakes with SmokeScreen rescaling settings for the small SRB particle emitters. - Moved a leg collider to allow for more accurate aerodynamic occlusion. - Added 1.25m-0.625m interstage thrust plate to the TweakScale config, and default VAB custom tab. - Drastically reduced career prices for fuel tanks, to bring them into line with stock again. - Increased career prices for engines, to bring them into line with stock again. - Added a 2.5m thrust plate, with 1x 1.25m and 8x 0.625m nodes (half scale version of the 5m model). - Adjusted leg deployment animation to reduce the "foot teleportation" problem. - Increased damper ratio on the leg suspension. - Moved conical payload bay to Specialized Construction tech node. - Added a 1.25m-0.625m interstage thrust plate. - Softened leg suspension spring. - Landing leg suspension works again. Suspension is very stiff to help prevent heavy vehicles from bobbing endlessly. - Landing legs updated to not be 100% deadly. Suspension still doesn't work, legs are rigid for now. - Added menu search tags. - Removed duplicate "MODCAT" entry for the SpaceY Expanded custom menu tab. - Added/enhanced custom category tab for FilterExtensions (will also include SpaceY Expanded, if installed). - Adjusted the MM rule for DefaultActionGroups to tweak the descriptions in the radial reaction wheels. - Added 5m color-changing to the R7 engine cluster. - Corrected the missing blue texture from the 3.75m tall 5m tank. 1.10 (2016-02-19) - The unintentionally quick update. - SRB 10R (radial) gimbal range reduced to 2 degrees (from 4). - Base (dry) cost of most SRBs (other than 3.75m models) increased slightly to align more with stock. - Added support for DefaultActionGroups mod, to automatically enable the SAS light on the radial reaction wheels. - Added color switching for 5m decoupler and separator, to match 5m tanks. - Added additional striped paint scheme to 5m tanks. - Switched the Color-Changing config to turn off alternate paint schemes via a slightly simpler method. - Added SpaceY Expanded's tech tree nodes. - Added a hidden Colossal Rocketry node for future use (and for other mods if they want). - Removed TweakScale "adapter_3_1" definition since it's redundant with default TS configs now. - Included ModuleManager version updated with its 2.6.16 bugfix update. - Added a "needs" condition for TweakScale patches. - Fixed the FilterExtensions category icon path. 1.8 (2015-12-31) - Texture updates. - Moved the "SpaceY Expanded" 7.5m tank texture into this pack. - Repainted default appearance for 5m tanks to use it. - Enables color-switching for 5m tanks even without "SpaceY Expanded". - 3.75m fueled short nose cone repainted with it too, removed grey stripes. - Reduced size of original 5m tank texture, removing redundant black/white areas. - Repainted 5m R7 engine to match, for compatibility. - Removed a fairing texture that was no longer in use. 1.7 (2015-12-22) - More separator goodness. - Added "SpaceY_ATM.cfg" with settings to attempt to disable or dissuade ActiveTextureManagement for this mod. - SpaceY is already very memory efficient and uses DDS, so ATM doesn't help much for this case. - Ejection charge reduced by half (to 400, down from 800). - Added built-in "sepratron" solid propellant separator motors. - Research cost increased slightly. - Added slanted variants of the sepratron nose cones. - Added a default custom part tab for VAB/SPH. 1.6.1 (2015-12-11) - Fix for nose cones. - SRB sepratron nose cones rotated 90 degrees, so that they play nice with mirror symmetry mode. 1.6 (2015-12-11) - SRB Overhaul. - Optional, requires Firespitter or InterstellarFuelSwitch core (DLL). - Added sepratron nose-cones for SRBs. - Fixed a typo with the engine heat animation for the K1 engines. - Replaced "placeholder" textures. Smaller, and more obvious when texture reassignment has failed. 1.5 (2015-11-11) - KSP 1.0.5 update. - Kiwi engine adjusted: slightly improved ISP, decreased mass, increased thrust. - Fuel crossfeed toggle added to decouplers. - Launch clamps updated with new contract constraints. - Ejectatrons updated to use new contract constraints, and exhaust damage reducer, and other thermal settings. - Updated heat shield to current stock ablator settings and contract constraints. Slightly increased ablator quantity. - Updated conical/petal bay to use current cargo bay thermal stats and allow door deployment limit. - Adjusted inner attachment node on conical/petal bay to be offset inward like new stock settings on cargo bays. - Updated all engines/SRBs to use FXModuleAnimateThrottle for heat animation. 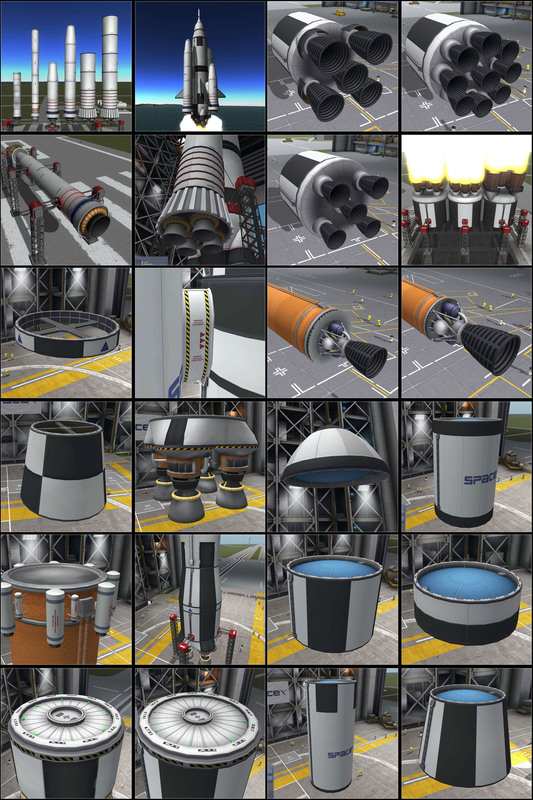 - Updated all engines/SRBs engines to use new standard thermal settings, and new career contract constraints. - "Automatic Switching" button hidden for cluster engines, since it did nothing. - Adjusted fuel tank texture settings to reduce log warnings when SpaceY Expanded is not installed. - Fairings, decouplers/separators, and more updated to use new stock-alike thermal settings and contract constraints. 1.4 (2015-11-05) - More colors, balance. - Added three new colors to 5m tanks (when color switching is available): Red, Blue, and Grey. - Diameters added to 5m fuel tank names, for easy identification in VAB menu. - Increased dry mass (did not alter propellant amounts, ISPs, thrust values, etc). - Wet/Dry mass ratio is on sliding scale. Larger & more advanced SRBs have better mass ratios. - Removed stripes from procedural fairings (will affect SpaceY Expanded as well). - Slightly improved the texture rendering for the 5m fueled nose cone in the VAB menus. 1.3.1 (2015-10-18) - Bug fix. - Fixed the ModuleManager conditionals to detect when the prerequisite mods are missing for fuel tank appearance switching. 1.3 (2015-10-16) - Engine and fuel tank Update. - Corrected some of the internal ID assignments (M/K engines). - Made corrections to particle scaling for all LFO engines. - Switched M,R series engines to use yellow flame instead of blue (RP1/kerosene inspired). Blue will be moved to the Penguins. - LFO engines will now animate their heat glow based on throttle (like "Better Emissives" patch) instead of temperature. - I've been debating this one for a while. We'll try this out and see how it goes. - It's contained in patch called "SpaceY_HeatAnimation.cfg". Delete it or rename the "cfg" part to disable. - Patch will also apply to SpaceY-Expanded engines. - New default custom flame/particle effects for all LFO (K,M,R series) engines. - New engine bell art assets for the M,R series of LFO engines. - Color switching added to 5m LFO tanks. To be enabled, requires Firespitter or InterstellarFuelSwitch, and SpaceY Expanded. - Added LC2 launch clamps to TweakScale config. - Removed erroneous flagDecal module from LC2 launch clamps. - Added bottom stack node and shroud to the R1 single Ratite engine. - Added surface attachment to K1,M1,R1 engines. - Note: May cause some occasional goofiness with saved crafts in the VAB/SPH saved with the old versions. Best to remove, re-attach, and re-save. - With InterstellarFuelSwitch or Firespitter, stack attachment bases can be toggled on K1,M1,R1 engines. - Improved labeling on shrouds for K1,M1,R1 engines. - Increased connection breaking strength on many parts. - Added second set of launch clamps, with long retraction range to reach around boosters. - Fixed a double entry in the TweakScale config. - Corrected an issue with some parts not showing up in CTT's tech tree. - Increased joint breaking strength on 3.75m and 5m thrust plates. - More file preparation to support the "SpaceY Expanded" dependency. - Added spotlights to the docking ports. - R1 ratite engine moved up to Very Heavy Rocketry tech node. - Custom sounds disabled by default, until better ones can be located. - To re-enable, rename "SpaceY_CustomSounds.txt" back to "SpaceY_CustomSounds.cfg" (note the ".cfg" suffix). - Added new "Massive Structure" tech node (when not using Community Tech Tree). - Moved all 5m structural/interstage adapters, docking port, and stack decouplers to this new node. - Moved all 5m structural/interstage adapters, docking port, and stack decouplers to "Experimental Rocketry" in CTT. - Cleaned up some of the Community Tech Tree configuration (organizing). - Added the longest 3.75m SRB to the Gigantic Rocketry node in CTT, where it should have been. - Added the longest 3.75m SRB to the Massive Rocketry node in non-CTT tech tree, where it should have been. - Converted the 3.75m SRB textures to DDS format. - Added missing manufacturer setting for 10R radial SRB. - A few minor tweaks in preparation for the 7.5m spin-off pack (since this pack will be a dependency). - Moved "README" and "CHANGELOG" to the mod's directory. - Corrected a problem with multi-mode engine gimbal. - R5 engine moved down to "Experimental Rocketry" node in Community Tech Tree. 1.0 (2015-08-05) - New things. - Changed version numbering to 1.x to indicate we're no longer in rapid growth. - Added a longer 5m (15m long) fuel tank. - Reworked the models/textures for the 2.5m SRBs. - Reduced heat production in all liquid fuel engines to be more stock-alike. - Slightly reduced heat production on 1.875m and 2.5m SRBs. - Slightly altered names on M-series and R-series engines for clarity. - Added ConductionFactor/convectionflux settings for petal bay. - Adjusted OMS/RCS blocks' RCS thrust vectors to remove 5-degree offset (and thus minimize cosine losses). - Moved custom engine sounds to separate "SpaceY_CustomSounds.cfg" ModuleManager file, for easy removal. - Removed middle attachment node that was added. - Replaced the 3.75m->5m cone fairing with the 2.5m straight fairing. (doubtful many people use that one anyway). - KNOWN ISSUE: If you used the new fairing in 0.17.3 (during the 12 hours or so it was available), the fairing will be invisible on ships already constructed. 0.17.3 (2015-06-26) - M1 update. 0.17.2 (2015-06-22) - KSP 1.0.3 balance update. - Updated thermal and ablator properties of heat shield, and removed transparency. - Updated thermal settings on many parts, for stock balance, including nose cones, fairings, SRBs, Engines, etc. - Fairing mass & thermal values updated. - SRB ISPs rebalanced, to be equal to some of the better performing stock SRBs. - Adjusted SRB propellant capacities and costs. - Corrected a problem with colliders on the new 21m long 1.875m SRB (should no longer fall through the pad). 0.17 (2015-06-18) - Thermal help, plus SRBs. - Increased "thermal mass" multiplier and heat conductivity for thrust plates. - Increased "thermal mass" multiplier for structural/conical size adapters. - Increased heat tolerance for thrust plates and size adapters. - Shortened SRB names to "SRB" instead of "Solid Rocket Booster" to save space in the UI. - Added a new (21m) long 1.875m SRB. - Added a new (9m) long 0.625m SRB. - Fixed R7 engine description. - Converted R7 supplemental texture to DDS format. 0.16 (2015-06-09) - New engine, etc. - Deleted an unused texture. - Moved the large launch clamps later in the tech tree. - Restored the R5 engine to 11,000 thrust (10% increase over the previous few versions). - Added new R7 engine cluster with integrated fuel. - Adjusted sound for R5 (and new R7) engines. - Updated Deadly Reentry config with more current data. - Small tweaks to conical payload bay; shielding should theoretically work better now. - Closed a small gap in the colliders on the conical payload bay. - Added VAB/SPH transparency to conical payload bay. - Increased cost, torque, and battery capacity in both probe cores. - Improved ISP for most engines at extreme atmospheric pressures (Eve). - Changed flag/agency images back to PNG format so they'll work again. 0.14 (2015-05-20) - Hot fix, finalizing as 0.14. - New RCS block set to be physicsless. 0.13.2 (2015-05-20) - Fixes & Engine rebalancing against stock. - Corrected the 3.75m fueled nose cone to appear in the size-3 bulkhead profile. - Corrected the manufacturer setting on the 0.625m SRBs. - K1 engine: Lowered vacuum ISP. - M1 engine: Increased mass slightly, and lowered vacuum ISP. - M5 engine: Increased mass, and lowered vacuum ISP. - M9 engine: Lowered vacuum ISP. - R1 engine: Increased mass slightly, raised sea-level ISP, and lowered vacuum ISP. - R9 engine: Raised sea-level ISP, and lowered vacuum ISP. - Added a 5-way RCS block (without integrated engine). - Fixed a minor texture issue with the smaller "Dibamous" RCS/OMS engine block. - Slightly increased RCS thrust on the smaller "Dibamous" RCS/OMS engine block. - Corrected several TweakScale settings to allow scaling of various engines, plus fairings and heat shield. - Small amount of gimbal added to 2.5m SRBs. - Added an intermediate sized radial SRB. 0.13 (2015-05-09) - More heatshield goodness. - Fixed a typo in the Community Tech Tree config. - Corrected the bulkhead profile for the new mini radial SRB so it's not listed as a size-0 stack part. - New texture for the procedural fairing panels. - Adjusted the procedural fairing panels to begin at upper edge of base. - Added large (5m) heat shield. - Tweaked the conical cargo bay's drag cube. - Fixed a configuration typo for the 3.75m to 2.5m thrust plate. - Reversed the attachment node priority order for extremely thin parts (docking ports, probe cores, thrust plates), so that they attach more easily. - Updated "Community Tech Tree" support for compatibility with CTT's new design. - Improved performance of monopropellant engines in atmospheric pressures > 1. - Corrected the career-contract settings for the launch clamps so that they match stock. - Added NASA engine sounds to SRBs and engine clusters. - Added a pair of small scale (0.625m) SRBs. - Improved gimbal on liquid-fuel engines. - Adjusted heat generation on all engines to correspond to KSP 1.0.1 changes. - Adjusted all engine thrust numbers to correspond to KSP 1.0.1 changes. - Added "drag box" settings for conical cargo bay. - Fixed the 5m engines to no longer cause continuous smoke on the pad. - Tweaked the max-temps on the engines and fuel tanks. Now only 5-10% more heat tolerant than stock. - Adjusted heat generation/dissipation values on SRBs to match stock KD25k SRB. - Lowered ISPs of the liquid-fuel engines, due to stock rebalance. - Tweaked some of the thrust numbers for the liquid-fuel engines. - Tweaked ISP range of the monopropellant OMS/RCS engines to match stock. - Slight correction to 1.875m SRBs exhaust positioning. - KSP 1.0 balance pass, and additional settings. - Added 1.0-like procedural 5m fairing. - Corrected several mistakes in the Community Tech Tree patch. - Updated the HotRockets config to have different vacuum/atmo effects. - Added some gimbal to the 1.875m SRBs (inspired by the Space Shuttle SRB gimbal). - Slightly updated the texture on the 1.875m SRBs, plus other minor fixes. - Added "command station" settings to the probe cores for Remote Tech. - Added 5m and 3.75m inline fairings with optional size adapters + associated nose cones. - Added 5m and 3.75m Stack Separators. - Added taller 5m and 3.75m fueled nose cones, in the style of the fairing nose cones. - Added Deadly-ReEntry settings for the existing and new nose cones. - Significantly increased torque/breaking strength of nearly all SpaceY parts. 0.9.1 (2015-01-21) - The "rapid unplanned disassembly" mitigation edition. - Increased torque/breaking strength of all radial reaction wheels. - Increased torque/breaking strength of conical size-adapters. - Increased torque/breaking strength of all fuel tanks (which were set slightly lower than the 3.75m Kerbodyne tanks). - Increased torque/breaking strength of all decouplers. - Increased torque/breaking strength of all engines & SRBs, except the Kiwi/K1. - Tweaked torque/breaking strength of docking ports. - Tweaked torque/breaking strength of petal payload bay. - Added a stack attachment node to "Dibamous" RCS/OMS pod. - Experimentally tweaked some strength settings on the docking ports. Let me know if this helps. - Adjusted colors on inside ring of large probe cores, to differentiate them in the VAB menu. - Adjusted size, positioning, rotation, and number of the legs. - Considerably improved strength / breaking force. - Switched to the actual landing-leg module to call the animation, so it responds to landing gear hotkey. - Added "SpaceX" style individual landing legs. - Added "Super Dibamous" combined RCS/OMS pod (larger variant of "Dibamous"). - All "thrust plate" parts have had their names adjusted, and color-coding added. - Added support for Connected Living Space, for the probe cores and docking ports. - Added RemoteTech support for probe cores. - Added Engine Ignitor support for launch clamps. - Added auto-shroud to tops of cylindrical fuel tanks. - Altered fuel tank paint scheme to be a little more glossy, and less "satin". - Removed the "ASAS" from the Radial Reaction Wheel texture, and slightly enhanced the gloss. - Added multi-mode operation to M5 and R5 engines, allowing for center engine cut-off, like Saturn-V.
- Added 5m landing-leg "ring". Warning: Must land lightly, probably 3m/s or slower. Fragility is a known issue. - Actually applied the thrust increase for the K1 Kiwi engine that belonged in the last update. - Corrected a few typos in part titles and descriptions. - Removed SAS from Reaction Wheel parts, since it no longer works without being on a command pod/core. - Updated the naming convention for all engines, SRBs, tanks, and size adapters to be clearer and more consistent. - Added mode-switching for the M9 engine. Alternate mode engages only center engine, for landing. - Corrected K1 "Kiwi" engine's manufacturer so that it shows up in the SpaceY tab. - Increased thrust slightly on K1 "Kiwi" engine. - Increased thrust of R-series "Ratite" engines by 10%. - Increased thrust of M-series "Moa" engines by 33%. - Increased gimbal range of all M-series engines to 3 degrees. - Added RCS/OMS "Dibamus" monopropellant engine and maneuvering unit. - Added an even larger SRB, a 2.5m x 23m monstrosity. - Fixed manufacturer icon in VAB/SPH manufacturer-sort. - Reduced dry-mass of fuel tanks, to be more competitive with the new Mk3 LFO tanks. - Engine/FuelTank split is automatic, but we went ahead and updated to explicitly categorize anyway. - Leaving SAS basic capability on the reaction wheel parts for now. - New naming scheme for engines, as a parody of SpaceX's naming. Flightless birds instead of raptors. - D1 engine renamed K1 "Kiwi"
- F1/F5/F5 "Falcon" engines renamed M1/M5/M9 "Moa" engines. - R1/R5 "Raptor" engines renamed R1/R5 "Ratite" engines. - Added TweakScale support for the M1 engine that was missing. - Repainted the ejection arrows on the radial decouplers to be blue. - Moved earlier in tech tree, to Heavy Rocketry, alongside Skipper instead of Mainsail. - Added a cylindrical shroud, and stacking capability. - Improved ISP (mostly at the vacuum end). - Corrected the attachment node to be 1.25m size (instead of the default of 0.625m). - Moved the 3.75m->2.5m and 2.5m->1.25m units earlier in the tech tree. - Reduced mass of the 3.75m->2.5m and 5m->3.75m units. - Slightly reduced costs of all three. - Added a fourth size: a shorter duplicate for the 2.5m->1.25m for use with smaller engines. - Adjusted naming convention of parts and model-numbers to be more consistent, across the entire parts list. - Increased gimbal range of all engines, slightly. - Decreased dry mass of all fuel tanks slightly (dry/fueled mass ratio is now between stock 3.75m and 2.5m tanks). - Added "D1" 1.25m booster engine. - Repainted 5m decoupler to match fuel tank stripes, and have blue triangles. - Repainted 5m to 4x 2.5m adapter, to match fuel tank stripes. - Added external fuel pipes on 5m to 3.75m fueled adapter tank. - Rotated engine bell pattern on F5 cluster engine, to match the R5 orientation. - Raised center engine bell on F5 cluster, so that all five are mounted at the same height. - Note: These are in the "nanolathing" 1000-point tech-tree node. - Changed "F1" engine to have conical size-adapting fairings instead of cylindrical. - Moves tall 2.5m SRB to "Gigantic Rocketry"
- Moves R5 (SaturnV-like) engine to "Gigantic Rocketry"
- Changed sort-order in VAB/SPH menus for SRBs and short tank, so short versions are first. - Added "Ejectatron", equivalent to 10x Sepratron. - Added intermediate height fuel tank. - Added 5m & 3.75m external-ring ASAS reaction wheel systems. - Added "R1" engine (single from the "R5" SaturnV-like cluster). - More thrust than Mainsail, and a little lighter, but much less efficient, costs more, and doesn't stack. - Added "F1" engine (single from the "F5"/"F9" engines clusters). - Less efficient and pricier, but more powerful and lighter than the Skipper. Accepts stacking in 2.5m and 3.75m. - Slightly improved "R5" engine cluster's efficiency. - Reduced the price and research costs of all liquid fuel engines. - Repainted fuel tanks, conical size adapters, and engines to be less "busy", and more SaturnV-like. - Slightly increased the "gloss" on tanks, so that the paint has more of a satin finish. - Updated TweakScale settings and moved them to a file called "SpaceY-TweakScale.cfg" for easy deletion/modification. 0.1 (2014-11-17) - Initial Beta test version. Decouplers with built in sepratrons!?!?!?!?? Wow! Yeah those sepratron/decouplers look amazing! Ooof. I will be trying this out today. Looks top notch. Thanks for your hard work! Although I wonder if they will cause a problem with the Deadly Reentry mod. I have had problems in the past where a sepratron's exhaust heated and destroyed the main rocket body when it was aimed at it. Very nice parts. I always want a 2.5m SRB and resort to clipping 12 or so 1.25m ones together, with suboptimal results and lots of fire going in directions it's not supposed to. I'll take a look at the thread too. I turned off exhaust damage on those, since sepratrons will normally do a lot of damage, DRE or not. That's quite a sweet mod! BTW, I see Saturn V and SLS alikes in the mod, will there be 7.5m N1 alikes? Something like 5-7.5 fuel tank and a thruster plate or an engine combination? Considering I've had little luck with combining Sepratrons with decouplers--OK I tried to weld them once and it wouldn't fire the Sepratrons unless you activated them via the menu--I am all for Sepratron/decoupler combos that actually work. Plus, I love your parts, and I'm kinda looking forward to making some HUGE rockets. There's also the SpaceX-like "F9" engine cluster in there, which messes with my brain, since while the SaturnV-like engine cluster is half the diameter of the real work counterpart (5m vs 10m), the 9-nozzle cluster is actually bigger than the Falcon 9's diameter (5m vs 3.66m). I hadn't thought about an N1, but it's not out of the question. So far I've been going for the "classic NASA" look, partially because I really like it, but also because it extends what they did with the ARM pack in 0.23.5. But there are all sorts of cool Soviet, ESA, and now Commercial alternatives out there too. Awesome! Glad you're liking the parts. I can't wait to see screenshots of what people come up with. Yeah, the sepratron-decouplers worked really well. And it was a "what if?" sort of experiment too, when I realized that large ejection charges were running into the bug that causes the boosters to get sucked back inward toward your center stack. The bigger I made the charge, the worse it got, so then I had the idea to use thrust instead. And it worked brilliantly on the first try. We all lucked out on that one, because it opens the door to making more of those sorts of things. Oh yes, it'll be hugely useful. Plus, I made them with fairly high thrust (especially the triple-packed one), so you can tweak them down to where you want them, or at least reduce the part-count by not needing so many actual sepratrons. BTW, if you look closely, I actually modeled the thrusters inside the decoupler (visible after separation), and left some scorch marks on the anchor. Heh, I just corrected the "this is a beta" warning in the thread, and on the download sites. I had copied the text from one of my other mods, and it erroneously stated that I had only worked on the mod for two days.. lol! That was only true on the fairings mod. I've softened the warning a bit too. It's unlikely that I'll have to change things enough with the existing parts that it will be savegame-breaking, but it's useful to have the warning there anyway. Well, I like that style too, I guess keeping it won't "bug" with other designs as well. N1 was also painted black and white NASA-style to control its rotation. It is actually possible to make a good looking N1-alike already with those parts (I'll post some screenshots later), but a 5-7.5m tank would make it better. I love the idea of stock-alike modpacks like MRS and Space Y, they really fit the niche. Hmmm... I DO like engine clusters. Perfect for heavy lifters AND Colony Ships/Mobile Stations. I'll take a look at this, soon enough. Thanks! These were definitely some interesting niches to work on, and I think can greatly benefit the community. Yeah, I hadn't originally thought about doing 7.5m (and 6.25 seems like a pretty small change over 5m, so jumping straight to 7.5 might make more sense), but after looking at the Community Tech Tree mod, it would be cool to have bigger stuff in higher tech nodes. I'll keep it in mind, but no promises right now. I love cluster engines too. Though I have to admit, the 9-way engine got a bit tedious, so I'll probably never do one with that many engine-bells again. But 4 or 5 isn't too bad to work with. I may talk myself into a 7-way at some point (which makes a nice hexagon pattern with one in the center). That's some nice parts you have there, sir! Great work with the modelling and texturing, I especially like the tank texturing! Four or five is good. Make a seven-way one ONLY if you feel there's a need. I remember the first Kerbin to Mun "Station" I made, and... well... it was more like five docked heavy rockets with five Mainsail engines... and those engines GUZZLED the fuel oh-so unfairly that by the time I made my Mun orbit, about maybe a QUARTER of the fuel I had was left. I do see that engine clusters are the way to go (I still need to construct a proper "Kerbin to... wherever I plan to have them go next" Colony Rocket [which I've attempted assembling in orbit, via-MechJeb], and my gut feeling says engine clusters are gonna help with both push AND fuel efficiency... plus two side batteries of either nuclear engines or those medium engines you start off with in Career Mode, for that extra push MINUS the fuel-guzzling). I very much like this pack. It's much improved from your MRS pack, which is kinda meh. It works very well with 3.2x scale. great, been waiting for this! 1. How well is it working for you so far? Any problems? 2. What would you like to see added in the future? Even larger (7.5m for instance) parts? More SRB/Decoupler options? Or are you satisfied that it fills the required niche?